DearMYRTLE's Genealogy Blog: Stand in line, overhear a conversation, and a week later order a book just to practice? Stand in line, overhear a conversation, and a week later order a book just to practice? Our genea-friend Carol Bowen Stevens took fingers to keyboard sharing her memory of a series of genea-miracles in her post "One Memory, My Best Genealogy Day, Well, One of the Best" in the Reflections from the Fence blog. She writes of the serendipity which Hank Z. Jones calls Psychic Roots. Sometimes despite all our planning and plotting breakthrough genealogy miracles happen. Let Ol' Myrt tell you about one of her miracles. If I hadn't been waiting in line for advice on a different family, I would never have overheard a conversation about Christopher GIST. The only surname name that came to mind on my first Library of Congress visit when using the then "high tech" DOS-based card catalog was for some reason GIST. 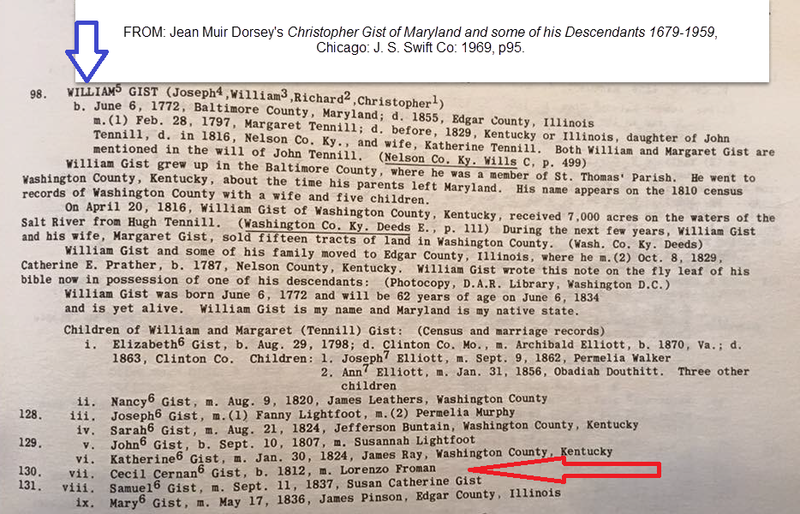 Just to practice ordering a book from the back stacks, I ended up finding the true name of Accelerman GIST who married Lorenzo Froman in Clinton County, Missouri in 1831. Standing in line behind two others to ask for help of the volunteer at the Washington DC Family Center, I couldn't help overhearing the volunteer's telephone conversation. I realized this call effectively put the three of us "in person" patrons on indefinite hold. The woman behind the desk referred to a book on the shelf that might help the "via telephone" researcher if that researcher would just come in to review it. Knowing my turn for assistance would necessitate a lengthy wait, out of curiosity, I walked through the book stacks, and located the bpublication the volunteer referenced. I placed it on the desk before her. She smiled, and flipped to page, shared a tidbit of info to assist that phone patron before absentmindedly returning the book to me. Not wishing to lose my place in line, I remained at the desk, and began to peruse the book for any GIST family members. It was a tombstone transcription book but sadly there was no index. I couldn't find a single GIST, let alone a woman named Accelerman GIST. Flipping pages back and forth, my eyes rested on the book's forward where it was explained the book was "presented to the Christopher Gist Society." Wow, there was the surname GIST, but no GIST entries could be found. Another complication? This Society was not in the state of Missouri where Accelerman GIST lived with Lorenzo J. FROMAN according to my mother's family group sheets. The following week marked my first visit to the Library of Congress' Local History and Genealogy Reading Room where I met my friend, the late Russ Kyger. I can remember on the drive down from our home in Silver Spring Maryland, that I sure had had an odd GIST experience the weekend before. When I got to the reading room, I discovered I'd left my to-do list home on the kitchen table. Undaunted, my friend Russ explained most books had to be ordered up from the stacks, and that I should get right to work using the DOS-based catalog system. He innocently asked "What names are you searching?" and all I could think of was GIST. 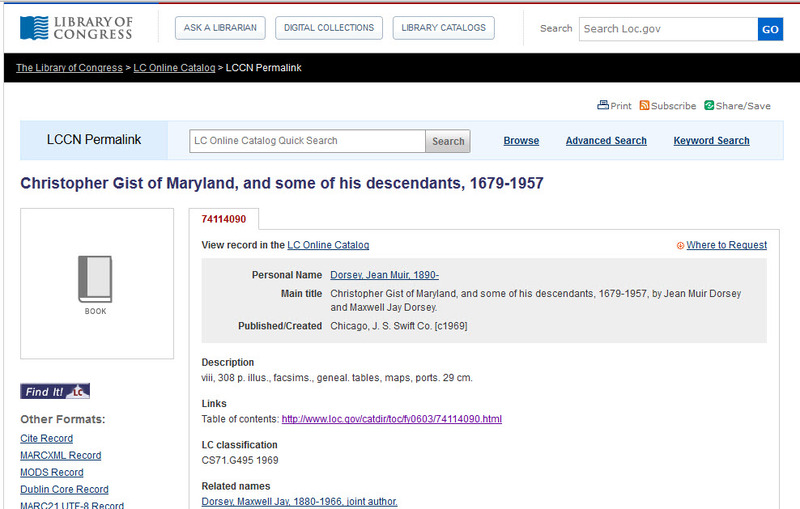 We soon located a book titled Christopher Gist of Maryland, and some of his descendants, 1679-1957. Again, I was thrown off base, since I had no knowledge of any GIST family members except my Accelerman GIST married to Lorenzo J. Froman in Missouri. I distinctly remember thinking, OK, let's just order it, since you are learning how to order books from the stacks, and so be it if there are no Missouri GIST folks in the book. IMAGE: Library of Congress screen shot. WILL THE REAL MISS GIST SIGN IN PLEASE? Is it possible my Accelerman GIST is Cecil Cernan GIST the 6th child of William and Margaret (Tennill) Gist who is listed in this book as married to Lorenzo Froman? Imagine my mother asking her grandmother: "What were your in-law's names?" Can you imagine her elderly grandmother saying "My first husband William Gist Froman's parents were, um (pause) Lorenzo J. Froman and ah (pausing) Cecel Cernan GIST. Tell me THAT wasn't a break-through moment. I was so jazzed, it didn't occur to me to copy at the very least the pages for the earlier generations chronicled in the book. Thankfully my friend Russ reminded me, and saw that I retreived all available clues from this compiled genealogy. Mr. Myrt took me to Old Stoney Point Presbyterian Church Cemetery in Clinton County, Missouri to see the graves of C.C. GIST and L.J. FROMAN back in 2010. It's no wonder I like him - he's a genealogist, too. born 10 July 1812, died July 3, 1890. Photo by the author.